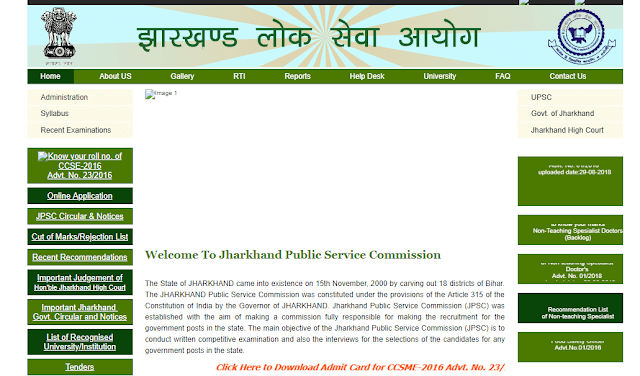 JPSC CSE mains Admit Card 2016: JPSC Admit Card 2019 Released for Combined Civil Services Mains Exam 2016: Jharkhand Public Service Commission has released the admit card on its official website. All those candidates who had appeared for the exam can download their admit card through www.jpsc.gov.in. The JPSC Civil Service Preliminary Exam 2016 was held on 18 December 2016 and the revised result was announced on 6 August 2018. Those who qualified in the Preliminary Exam can appear for the Main Exam from 28 January 2019 onwards. Candidates who will qualify in the main exam will be called for Interview. The Combined Civil Services Mains Exam 2016 is scheduled to be held from 28 January 2019 to 1 February 2019 at various exam centres of Ranchi District Head Quarter.